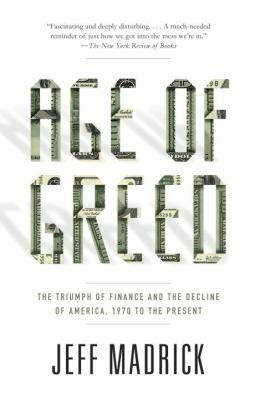 economists, and financiers who declared a moral battle for freedom but instead gave rise to an age of greed, Madrick traces the lineage of some of our nation’s most pressing economic problems. He begins with Walter Wriston, head of what would become Citicorp, who led the battle against government regulation. He examines the ideas of economist Milton Friedman, who created the plan for an anti-Rooseveltian America; the politically expedient decisions of Richard Nixon that fueled inflation; the philosophy of Alan Greenspan, on whose libertarian ideology a house of cards was built on Wall Street; and the actions of Sandy Weill, who constructed the largest financial institution in the world, which would have gone bankrupt in 2008 without a federal bailout of $45 billion. Significant figures including Ivan Boesky, Michael Milken, Jack Welch, and Ronald Reagan play key roles as well.Intense economic inequity and instability is the story of our age, and Jeff Madrick tells it with style, clarity, and an unerring command of his subject.From the Hardcover edition.